The same founders of Yebo casino launched another gaming centre recently, specifically targeting South African players with a sweet tooth for mobile play. 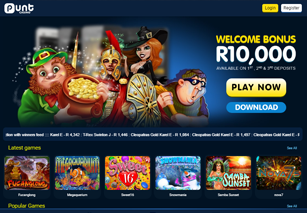 Even the biggest skeptics of South African players will succumb to the charms of Punt Casino, a brand new 2017 establishment with a simple website layout and an impressive game range from Real Time Gaming. A top notch instant play offer and an appealing bonus program will get you in the right mood for placing a wager or two in South African Rands. By all means, go for it, you’ll have a flattering choice of banking methods to choose from and if you find yourself in need of help, customer care will make your problems go away in a flash. Whether you own Apple, Android, Blackberry or Windows mobile device, you can access over 120 casino games at Punt Casino. The games are fully optimised for mobile play and accessible through your mobile browser. When playing on smartphones or tablets you can enjoy all the features of the games just like with their online counterparts with no losses in functionality or aesthetics. The games available at Punt Casino Mobile include slot machines, table and specialty games and Video Poker variations. A well-known brand in the online gambling industry, RealTime Gaming (RTG) is deservedly an award winning online casino software provider. Their casinos are available in instant-play, download and mo-bile version and Punt is no exception. Along with a proven range of popular games that represent all the features that RTG does best, such as graphics and gameplay, Punt Casino has its lobby complemented by intriguing slots, roulette and blackjack variations, over a dozen video poker titles and specialties like Pai Gow Poker, Keno, Sic Bo and Red Dog. Spin the reels of Cleopatra's Gold or Aladdin's Wishes for a full RTG experience. Punt Casino is licensed by the Government of Curacao, while the RTG software is repeatedly tested and certified by Technical Systems Testing (TST) and Gaming Laboratories International (GIL). Punt Casino doesn’t mind if you take advantage of its bonus offer - that’s what it’s here for. The most exciting thing about using bonuses and promotions is the R100 no deposit bonus everyone is entitled to upon registering an account. The wagering requirements for a no deposit bonus are set at 60x. Afterwards, the customers are free to claim the three welcome bonuses up to R10,000 free. Punt Casino also offers a 15% Daily Cashback and Daily Bonuses. Players can also take advantage of the VIP and Refer a Friend programmes. Punt Casino takes customer service seriously. The support team is on call 24 hours a day, 7 days a week and players can make contact through a toll free phone for South African customers, email and Live Chat. All queries will be treated with professionalism and cordiality. At Punt Casino you can choose among VISA/MasterCard credit and debit cards, SID transfers, Eco-Payz/Neteller/Skrill and Bitcoin when funding your account or cashing out. Players are allowed to deposit at least R25 and cash out the minimum of R300 or R500, depending on the payment method they opt for. All your personal and financial data will be totally protected by SSL, so the gameplay will be your only concern. WHAT DO WE THINK OF PUNT AS A WHOLE? Whether you play casino games from your desktop or mobile device, Punt Casino will provide you with a safe and fair gaming experience. Make use of its hard to resist bonuses and take your chance on the games to your liking to win hefty payouts. With safe and reliable banking options and helpful customer support agents at your disposal, you will undoubtedly enjoy your stay at the youngest South African casino.